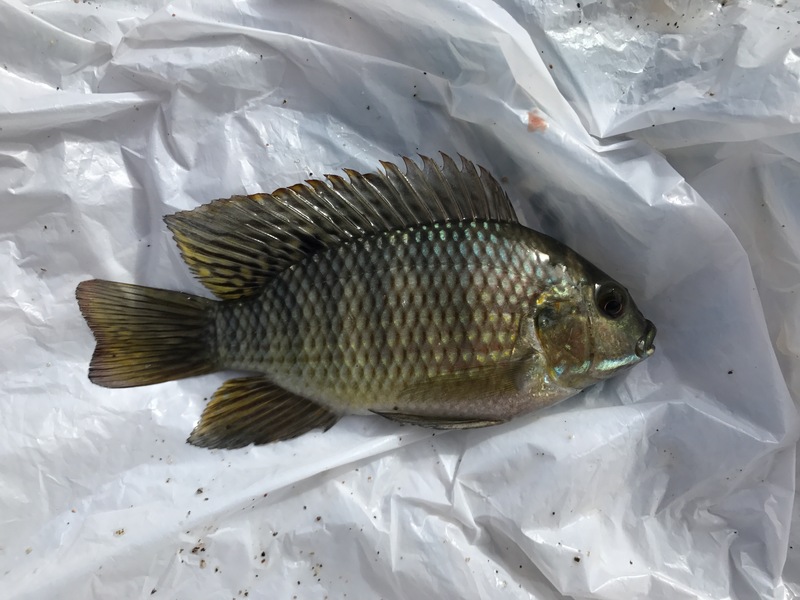 Though they’re invasive pests in much of Arizona, the Redbelly Tilapia I caught were plentiful and fun to catch. While the first Rio Grande Cichlid was easy to catch, the next dozen or so fish I caught were Redbelly Tilapia. These feisty and beautiful little fish came out of the weeds with every drop, looking to pounce of any- and everything I dropped into the water. It wasn’t challenging fishing, but it was a blast, as I worked my way to first 50-plus-fish day outside the state of Oregon. I wanted to explore and look for new species, for big bass I assumed had to be there, and to hunt for the elusive plecostomus catfish I’d heard lived nearby, but I couldn’t pry myself away from the fast-paced action the tilapia afforded. Using a tiny jig tipped with worm was the ticket, and though success dropped off after a few hours when my worms were disgusting mush tubes instead of recognizable bait, it was still worth the walk in to that part of the river along the long, dusty road. The only downside? Short any acceptable fishing footwear I’d worn a pair of White Air Force Ones. Read the next entry in #SpeciesQuest here: Species #109 — Blue Tilapia.